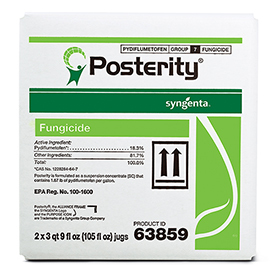 Posterity® fungicide, the most active SDHI in the turf market, is now available to deliver power that lasts, holding stronger for up to 28 days of dollar spot control and setting a new standard for spring dead spot control. Posterity is also a solid rotation partner for fairy ring control. Engineered for power and endurance, Posterity was designed to stay in the plant longer for more consistent control. It fits in agronomic solutions to protect cool- and warm-season turf and is excellent for fall treatments that hold strong until winter. Learn more at GreenCastOnline.com/Posterity. ©2018 Syngenta. Always read and follow label instructions. Some products may not be registered for sale or use in all states or counties and/ or may have state-specific use requirements. Please check with your local extension service to ensure registration and proper use. GreenCast® and Posterity® are trademarks of a Syngenta Group Company.